While the PC is not the obvious “go to” platform to facilitate the needs of racing fans, every now and then a true gem will appear that gives desktop junkies another reason to remain proud. And the finest of these gems is none other than the TrackMania series. 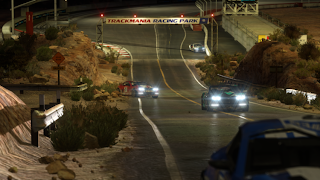 TrackMania has always been a premier franchise for the system, but Gran Turismo this is not, the cars are not licensed and there’s no fine tuning for changes in performance. At its very core TrackMania has always been a pure arcade racing experience with the true star not being the cars but as the title suggests all of the games character and magic is imbued into the tracks themselves. After releasing several instalments since its debut in 2003 Nadeo have gone for a true sequel to the franchise (as this is currently the 7th). However the entire game has been stripped back down to one location setting and only one type of car. This decision does come as a surprise considering that previous titles in the series offered a range of seven different environments each with their own unique vehicles. Despite the emphasis on going back to basics what TrackMania 2: Canyon does offer is an incredible scope of depth with a surprisingly large amount of variety which easily matches if not succeeds its predecessors. Keeping with tradition, the main gameplay of TrackMania 2: Canyon is not racing against others, competition stems from besting one another in solo time trials. All other racers are ghosts of previous records which can be used by the player as a visual guideline that offers insight on how to deal with the games more tricky obstacles. TrackMania 2: Canyon allows a player to instantly restart at any time with the press of a button, this is a must have feature as the slightest mistake can potentially mess up your time or even send you careening off the course entirely. Every track is a learning curve, study and repetition are a necessity in order to shave a few extra seconds off your best time and before long the process of quickly restarting over and over becomes second nature. Ha! Look at that guy! Who drives on the ground anymore!? Though despite this emphasis of repetition you’ll find very little boredom here, the majority of the tracks are short and sweet “A to B” affairs which can be mostly completed in under a minute. Early levels start as somewhat mundane so that players have the chance to get familiar with the car’s handling but before long the game acquaints players with the insane roller coaster inspired tracks which have become a staple theme of the series. TrackMania 2: Canyon at times can be a hard game and is not for the faint hearted. 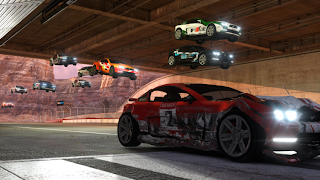 Sometimes the solution to certain obstacles is not always obvious as the game tends to break away from the majority of standard racing game conventions when it comes to controls and physics. Even when compared to previous titles in the series the initial bar of entry is higher than usual with early levels being fairly unforgiving at times. Even the most hardened of TrackMania veteran will have to learn an entirely new vehicle which resembles a mixture of previous cars from the series, greater emphasis has gone into brake drifting and jumps are not always solved by naturally going flat out on the accelerator anymore. Also with each new difficulty setting the player is pulled into a new location within the canyon environment, later levels always add something new keeping players on their toes at all times. Online play is rather similar to the single player variant but is enjoyable none the less, all players have a set time limit in which to set their best possible record and servers can easily handle up to numbers of fifty or more players at a time. Here you will get a chance to experience a mixture of official and custom made content depending on the server, occasionally some lag is present but since players can’t hit each other this provides very little annoyance to the experience overall. Graphically for a PC game, TrackMania 2: Canyon is only adequate at best. While environments and textures are clear and distinguishable enough to allow no hindrance to the gameplay, it is clearly obvious that there are prettier looking titles available on the market. Textures have a tendency to pop in with very little subtlety however when this does occur the player will be concentrating more on the road rather than staring into the distance. The game also holds itself back graphically purely because of its location setting, being centred mainly on a canyon expect to see a lot of brown and grey with little room for variation. Though despite these issues, graphically the game isn’t completely mundane, the lighting is visually stunning and it has been used to great effect to add an extra amount of splendour. Despite not sporting the best visuals, TrackMania 2: Canyon runs at a smooth and consistent frame rate, which considering the difficulty of some of the tracks comes as a complete godsend. TrackMania 2: Canyon is accompanied by a fairly competent soundtrack. Sound effects such as engine noises and tires screeching are always meaty and satisfying. In addition the game also offers a light number of techno tunes that sit nicely on top of the overall experience, music tracks give just the right amount of atmosphere while at the same time fade into the background therefore avoiding the possibility of becoming repetitive and annoying. A lot of TrackMania’s design choices have always been a result of the limitations of the PC and Canyon is no exception to this rule. The controls are easy and straight forward and while some sort of game pad is recommended the game uses no analogue buttons for acceleration and breaking allowing players to pull off a high level of competence with just the keyboard arrow keys alone. 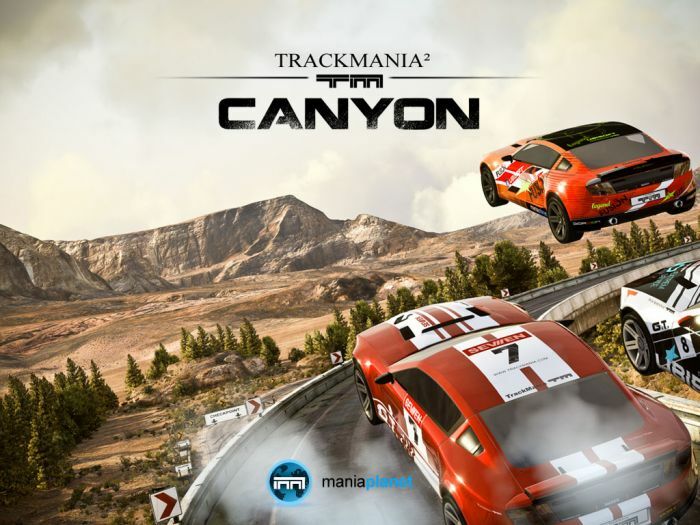 In keeping with the focus of surpassing limitations, TrackMania 2: Canyon offers an excellent local multiplayer format in the form of the Hotseat mode allowing up to eight players to take turns competing for the best possible lap within an overall time limit. Once every player has set a lap the player with the slowest lap time has the opportunity to redeem themselves by besting another player before their total time limit runs out. This mode creates a surprisingly fun experience and also by design allows the better players to sit back while the less experienced get more playtime overall making it a worthy candidate for a good party game. It's time for some serious racing! Also for the first time TrackMania 2: Canyon offers a split screen mode allowing up to four players the chance to race each other simultaneously in the spirit of traditional racing games. However this mode is plagued by a heavily reduced frame rate making it seem like a poorly tacked on last minute feature. 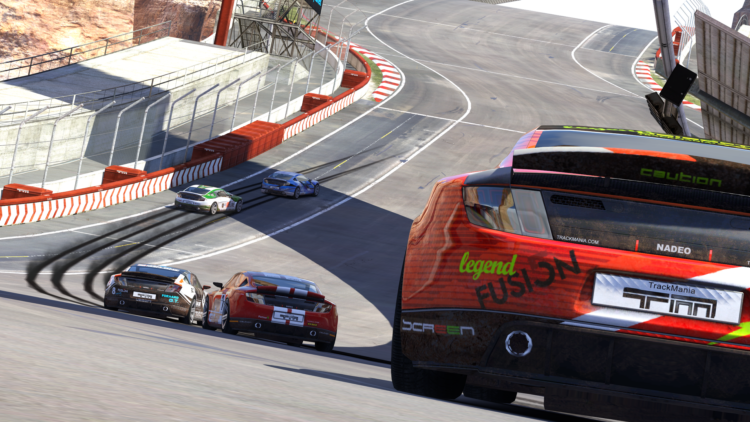 Where TrackMania 2: Canyon truly stands out from its cotemporaries is in its design mode. Track creation is a simple as sticking “Scalextric style” pieces together and while anyone can make a track within minutes the editor offers a staggering number of options with the facility to allow designers to create content that is truly unique to their own creations. TrackMania has always thrived due to a large community emphasis on creating new content and distributing it freely to other players, but sadly locating new content is not as easy as Canyon lacks the previously used in-game browser. If you want to track down the majority of custom content you’ll have to fire up your internet browser. Also one final mention that needs to be made is on the games menu navigation. It is completely unchanged from previous titles in the series and while TrackMania 2: Canyon has taken so many leaps forward it still chooses to use a very archaic and far from friendly user interface. The game can be more than unclear to understand at times and general navigation is a tremendous chore. If you are using a game pad you will find yourself reaching for the mouse more often than you think. While TrackMania 2: Canyon has undoubtedly pulled a lot of the series previous content in exchange for major refinement it seems that what we’re seeing is only the tip of the iceburg. Nadeo is already working on several additions to Canyon that will be added at a later date to their ManiaPlanet community tool which they promise will expand the game to more than double the amount of its current content. Also a lot of the TrackMania community have yet to migrate and are currently sticking with the previous title “Forever”. So until then only time will tell as to whether TrackMania 2 will enjoy the same amount of longevity as it predecessors, but it goes without saying, as a standalone game it is an experience that shouldn’t be missed. Thankyou very much for your support. This is actually my first review on the site so I'm quite pleased in the knowledge that at least one other person has actually read it. My next review should be done sometime soon after christmas so hope to hear your comments once again.